Hopefully I can rally enough people to make it a bloody big podcast. 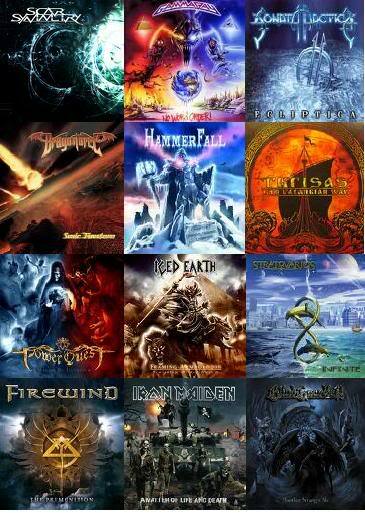 I have extreme confidence in Power Metal fans because they tend to be the more intelligent of the metalhead hierarchy. Which is why you don't see me a member of Thrash or Brutal Death metal forums. dud, fok off! u wast my time and time of every1! fok this! I'd like to but... My English is poor hehe. Join in anyway. We have people from Sweden, Mexico, France, Germany, Canada, and more joining in. You don't have to speak though, because Vent has a text chatroom available as well so you can communicate with other fellow metalheads if you are not confident in your spoken English. It's not TeamSpeak, it's Ventrilo, it's way easier to use and I can help you out if you need. Besides, it would be awesome to have YOU there. One of the larger personalities in popular Youtube Metal channels. Yes, me and my limited knowledge of the actual musical techniques behind what I listen to. I listen to what makes me feel the best and most varied emotions....which is metal and its sub-genres. So what? It'd be nice to have a larger crew there. If you'd like to join, i'd be glad to introduce you. I'll try to get myself there. Wait, what time will it be? There's two times being pondered. I'll try to show up if I can, I can use a Rock Band mic or something. Will my dad's computer's speed matter? It's been pretty slow. Will it mess up? Ventrilo is a low requirement program, I doubt it's going to do anything to your computer. I've worked Ventrilo fine on one of the crappiest computers 2 years ago, and i'm pretty sure it's worse than yours. With the worst internet and low RAM. those times suggested both seem fine to me. I was thinking it might be at like 5am for me or something, which obviously I could stay up for, but would be even more tired. It appears we're starting at 3-4pm EST. So around 10-11 for you English. nice video, ill do my best to be there; though my knowledge of any subculture is limited, i can offer my views as to why metal can be enjoyable with or without a subculture. Should be like 2pm CST. CST is Central i'm sure. Lol, I haven't had proper sleep in so long. Life is too much of a quest to sleep!